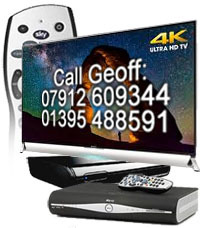 The Aerial Installer & Satellite Installer for Exeter, Exmouth, Honiton, Sidmouth, South/North/East & Mid Devon! I’m Geoff Price, a local aerial installer & satellite installer for Exeter, Exmouth, Honiton, Sidmouth and surrounding areas. I’m so passionate about making sure you get a great service, I offer an unbeatable 2 YEAR GUARANTEE on all work. Don’t settle for shoddy, unreliable work – call me today! …or give me a call direct on 07912 609 344 or 01395 488591. I might be out and about on a job, but if so I’ll call you straight back when I can. Geoff really knows what he’s talking about, knows what he’s doing and does it very well. Our old installation was a mess, but he knew exactly what to strip out and what to replace it with. Very professional all round and completely committed to getting it right and leaving the customer satisfied and happy. Thanks again. Simon Barry, Exeter. Customer satisfaction is my priority, both in cost and quality. My aim is to give a same day service in Devon that gets it right first time – which is why I get great word-of-mouth referrals from customers recommending me to their friends in need of an aerial or satellite installer! I’ll always be upfront about costs and explain everything beforehand – before you have to pay anything. You’ll always know the cost before the job is started and therefore you can choose if you want to go ahead with the project or not. Sometimes different options or solutions are available, so you might have to choose depending on what you want. Give me a call and we’ll sort it out!